Combine nutrition can be found in the form of dry mix fruit. The mouth-watering taste along with a mix of spices will win the heart of your loved ones and make them addicted. 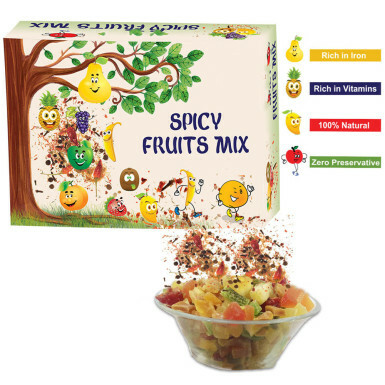 This spicy fruit mix pack is easy to preserve it for a long time as compared to real fruits. You can gift this spicy fruits to your loved ones instead of fruits. Winni always take care of your gifting needs and therefore bring you this Spicy Fruit Mix pack to give a spicy twist in your life. Go ahead & order it right now!